Preacher: Season 1, Episode 4 - "Monster Swamp"
Battle lines come into focus, as Preacher continues its weird and wild ride. Subtitle: Season 1, Episode 4 - "Monster Swamp"
Preacher is absolutely bonkers. It's a show with angels, vampires, single soccer moms, evil corporations, whorehouses, and one preacher with a power for which he doesn't even possess full knowledge. As a viewer, I can honestly say I’ve no idea where this show is going; as a critic, I absolutely adore that fact. Episode four, entitled "Monster Swamp" opens with a sequence as bewildering as the season up to this point as a young girl runs, seemingly for her life, through a deserted Annville town square, only to be shot with a paintball before falling to her death into a hidden well. The fallen is an employee of the local whorehouse, and the shooter a customer and member of the still mysterious Quincannon Meat and Power Company. 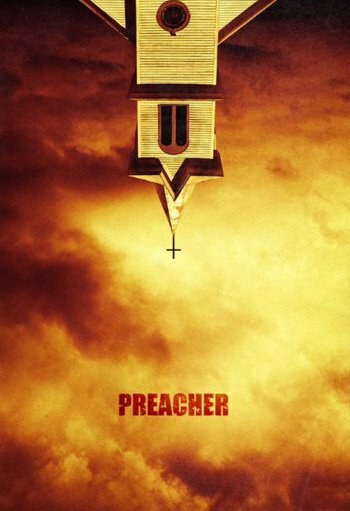 This opening sequence is live and exciting and intriguing but it also represents what, if anything, could change Preacher from being fun crazy to just simply too much to handle. When, in the next scene, we get back to Jesse (Dominic Cooper) in the church -- albeit in childhood form -- it would be just a little more satisfying to get some more exposition rather than more perplexity. The fact that these flashbacks, which weave their way throughout the episode, offer us some insight into just the kind of man Jesse's father was and how exactly his moral code played out in action. We know Jesse has turned far from what his father would have wanted, but seeing the senior Custer (Nathan Darrow) beat his son in front of his friends leaves us with a decidedly sour taste in mouths. One of the storylines that seems to be settling into place is Cassidy's (Joseph Gilgun) continued negotiations with the Angels: Fiore (Tom Brooke) and DeBlanc (Anatol Yusef). Their growing place as the bumbling, inept demon hunters paired with Cassidy's strict self-serving treatment of Jesse's powers is becoming the comic relief in an already black-humor stuffed show. Almost Coen brothers-like, the angels seem to know almost as little as they say, and surely do not recognize the situation they are facing. This is perfectly encapsulated when Fiore dryly remarks that he doesn't fully trust Cassidy, an idea it took him far too long to come to. The main crux of Preacher, though, will always be with Jesse and how he handles the moral implications of his newfound power. Last week he hinted that he could use it strictly for score settling by threatening his best bud Donny (Derek Wilson) with suicide, but now we see him move in a different, though perhaps not wholly revenge-free, direction. Instead of listening to Cassidy or Tulip (Ruth Negga), he seems set on using his powers of persuasion for God, and perhaps just a little bit for the memory of his father. If there is one thing every preacher wants, superpowers or not, it’s a bigger, more devoted congregation. Jesse is no different. His plan, which includes a flat screen raffle and some well-placed word of mouth, truly rest on one man, a man who we still know frustratingly little about. Odin Quincannon (Jackie Earle Haley) seems poised to become the ultimate big bad of the show, with his silent menace, his evil corporation, and his utter dismissal of anything to do with the death of the woman in the opening, but up to now he really hasn't given any indication of what is his ultimate goal. Through both the flashbacks and some tidy exposition, we learn that the Custer land has been coveted by the Quincannon family for some. Knowing this, Jesse sets Quincannon up by offering him the land in reward for simply attending one of his services, an agreement that doesn't include a warning that the attendee may or may not be brainwashed. In Dominic Cooper's finest monologue to date, Jesse offers a brash take on the foibles of the modern man right before showing off his new powers for the first time in public by convincing Quincannon to "serve God". Whether Jesse’s not quite literal speech will come back to haunt him -- I was reminded of the classic Twilight Zone episode in which "to serve man" was more Rachel Ray than the humans expected -- but the gauntlet has certainly been thrown down. Quincannon has been a thorn in the Custer's side for long enough, and Jesse's happy to combine revenge with giving his church a little kick start. I, for one, am excited to see just how far he's willing to take it.